Home > Shop By Brand > McKee's 37 Waxes, Compounds, Coatings > McKee's 37 Hydro Blue Wash Kit – Limited Time Only! Wash, decontaminate, and protect in one super-savings kit! McKee's 37 Hydro Blue Wash Kit is a limited-edition kit created for detailers looking to experience the most from the new McKee's 37 Hydro Blue Sio2 Coating. With a product for every step of your detail – including decontamination! – McKee's 37 Hydro Blue Wash Kit gives your paint a full clean before protecting with the sprayable McKee's 37 Hydro Blue Sio2 Coating. If you haven’t had a chance to try the newest addition to the McKee's 37 line-up, the McKee's 37 Hydro Blue Wash Kit is the perfect introduction kit! 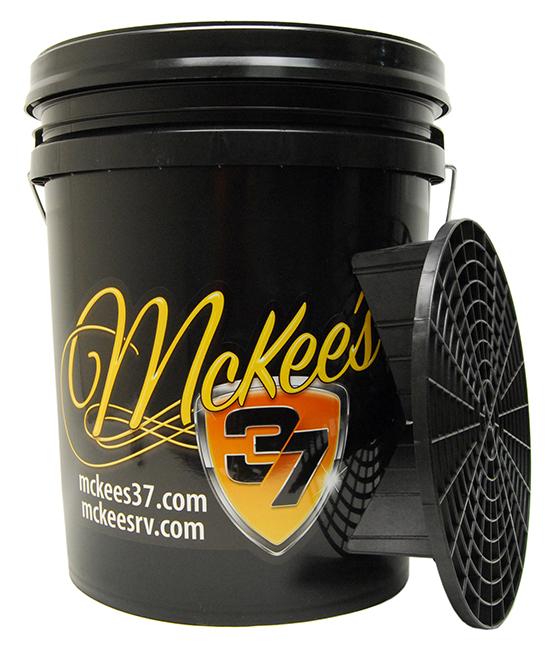 The McKee's 37 Bucket with Lid & Grit Guard includes the swirl-preventing bucket system and the Gamma Seal Lid. Just add your favorite lubricating car shampoo and you’ve got the makings of a safe, swirl-free wash. The McKee's 37 Bucket with Lid & Grit Guard includes the revolutionary Grit Guard Insert, a radial grid that traps dirt at the bottom of the wash bucket. It serves as a wash board to agitate and release dirt from the mitt. This process prevents dirt removed from the paint from transferring back to the vehicle from the dirty wash water. This smart system improves your odds of washing your vehicle without producing swirls. McKee’s 37 Hydro Blue Sio2 Coating combines the ease of a quick detailer with the enhanced protective abilities of a Sio2 coating. McKee’s 37 Hydro Blue is a spray and rinse formula that easily applies to wet paint and provides an extremely high-gloss layer of protectant that can withstand even the most extreme climates. Perfectly safe for use on any exterior surface of your vehicle, McKee’s 37 Hydro Blue Sio2 will become a must in your detailing supply cabinet. Microfiber cleans, it scrubs, it polishes, it dries – it’s the multipurpose miracle fabric! Could there possibly be a way to improve upon our Cobra microfiber towels? Of course, there’s always room for improvement! Now our Cobra Supreme Waffle Weave has a silky satin edge to further protect your paint from potential scratches. We also gave it a new color, just for good measure. We call it The Supreme Guzzler! The Supreme Guzzler is 20% thicker than the original towel to give it an even greater capacity for moisture. At approximately 5.5 square feet, this waffle weave towel can dry most small cars without being rung out once!